Generally, If you do not have acknowledgement no. 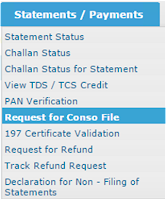 of Original Filed TDS return then you are not able to apply for Consolidate file / Justification Report. But if you have Digital Certificate of authorised signatory or director or partner or proprietor, then you will able to apply for consolidation repot / justification report for any year or any quarter without original TDS Acknowledgement of that quarter which you want to apply. But you need last filed TDS return original statement with Acknowledgement for registering digital signature on Traces Portal. First, you need to register your digital Signature on Traces Website. After that you will are able to do the above procedure. Q. How to apply consolidate file with Digital Signature? A. 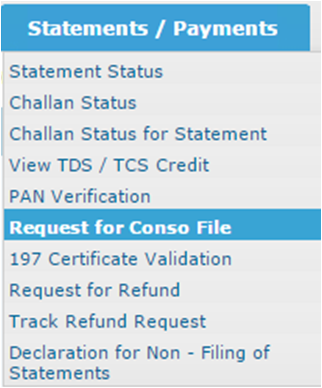 After login, go to Statements / Payments Tab - Request Consol File. Now screen show you for select the desire period for which consolidated you want to apply. Select period, and click on Go tab, following window appear for validation of Digital Signature. Now Click on Validate DSC and Select digital signature (You must plug your digital signature before apply consol file). Now click again on validate and your request will be submitted. Without waste time you can apply another year consol file or any statement with this method.